Click on the links below for detailed information about each category. Deadline for projects submitted to the State PTA: February 1, 2019. The National PTA Reflections program is PTA’s cornerstone arts program. It was developed in 1969 by Colorado’s PTA President Mary Lou Anderson to encourage students to explore their talents and express themselves. Since then, the Reflections Program has inspired millions of students to reflect on a specific theme and create original artwork. Each year, students in Grades Pre-K through 12 are recognized for bringing the theme to life through dance choreography, film production, literature, music composition, photography and visual arts. In 2012, the Special Artist Division emerged as an optional division for students whose physical, cognitive, or mental health challenges meet ADA guidelines. The arts—and the National PTA Reflections program, in particular—can be a valuable tool for building stronger partnerships in your school community. 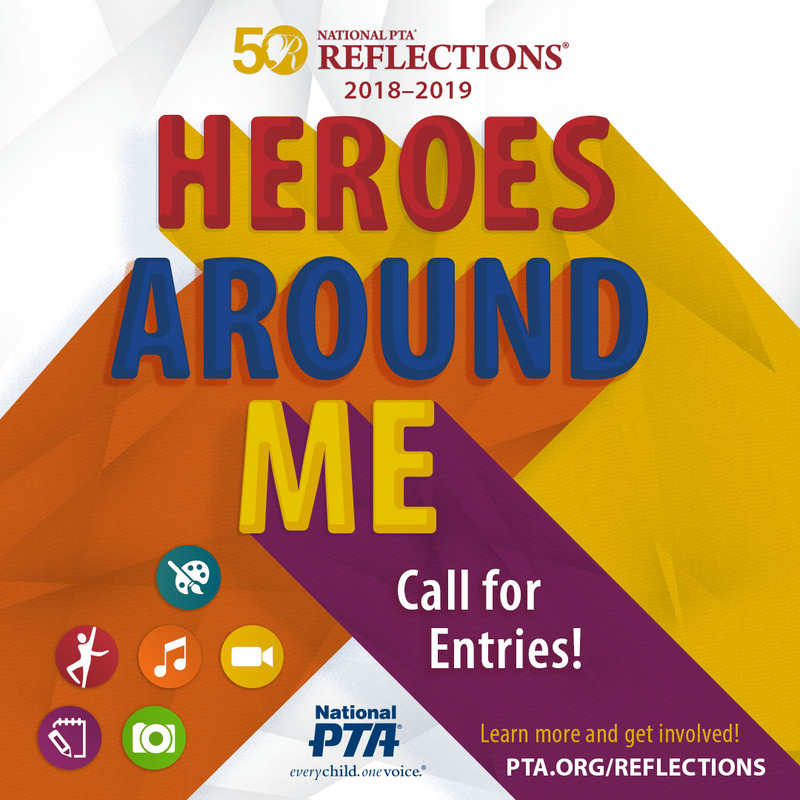 The theme for PTA’s 2018-19 Reflections Program is "Heroes Around Me"
Through the Reflections Awards Program, you can play a role in providing a positive learning environment for students that fosters self-exploration, encourages creative thinking and problem-solving, and promotes the exploration of arts and culture in the home, school and community. Any active PTA/PTSA in good standing is eligible to implement a Reflections Program. West Virginia PTA has a committee that is focused on implementing the Reflections program. West Virginia PTA will have specific guidelines and deadlines, as well as a step-by-step Local PTA/PTSAs Reflections Guide. Contact the state office and/or the Reflections Chairman. The National PTA has rules for each arts category and the Special Artist Division. Each contestant must follow both the general rules and the category rules to be eligible for the National round. Planning your program begins with recruiting others to help you, such as school staff, parents interested in the arts, or community arts organizations. Your State PTA will provide you with a step-by-step planning guide to help you implement the program including planning, promotion and celebration tools. Check out National PTA’s website for specific materials for the Reflections program at www.ptareflections.org.